There is nothing more I love than my sorority but I think jewelry is a close second. When you combine the two, there is an explosion of love and obsession coming from me. I have a few pieces of jewelry barring my sorority letters and I wear them every chance I get; I have two rings and a bracelet. I love them all, I love representing my sorority in a subtle way. I'm always looking for new brands that offer gorgeous pieces of sorority jewelry and I was so happy to find a little surprise in my inbox one day giving me just that. The Collegiate Standard contacted me about doing a partnership/review of their website and one of their products. I was totally ecstatic about this opportunity and I'm so happy to finally be able to share it with you all. All the jewelry is definitely within a college student's budget; how can you go wrong with a beautiful $20 necklace baring your letters? They offer everything from necklace lavalieres, to rings, to bracelets. And it's not just letters that the jewelry is donning but symbols as well. 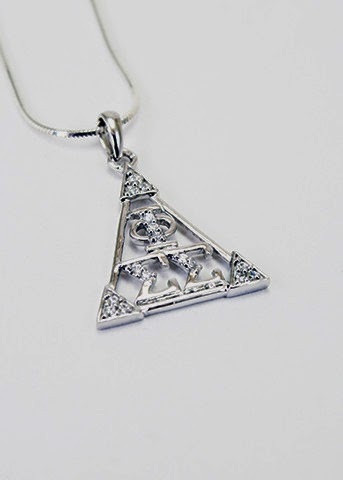 For example, my beloved Phi Sigma Sigma's symbol is a pyramid and I think this is the most gorgeous necklae I've ever seen. TCS was kind enough to send me my own beautiful necklace to love and cherish, and review for you all. It's a diamond heart pendant with my letters shining bright. The chain is a little bit small for my liking but it's still perfect. The people at The Collegiate Standard are so wonderful that they are offering a special coupon code to Royally Pink readers so go and get your jewelry today!